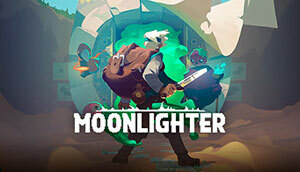 Merchant by day, adventurer by night; Moonlighter follows the owner of the eponymous shop as he yearns to discover the great secrets of the dungeons close to his town. 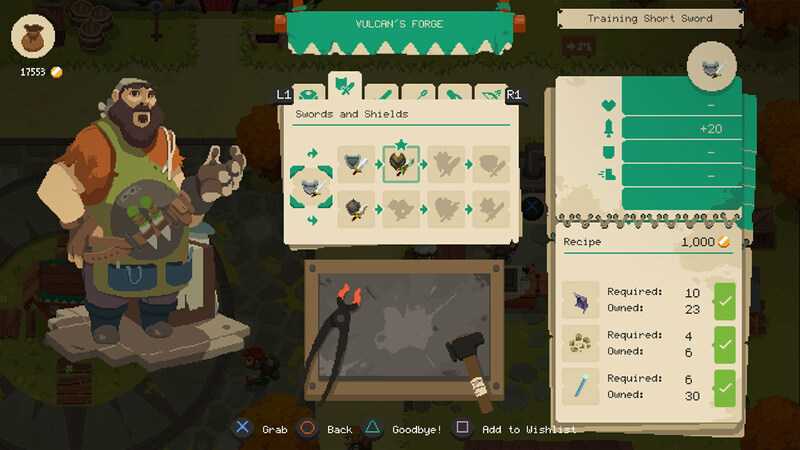 Part shop simulator, part top-down adventure à la classics like A Link To The Past, Moonlighter puts you in the shoes of merchant Will, who is in charge of the daily running of his family’s Moonlighter store, which supplies local townsfolk and hopeful heroes with loot pilfered from the four dungeons just outside of town. With wanderlust and curiosity in his heart, Will sets out to explore the dungeons each night, daring to venture beyond the well-tread areas and seeking to discover the secret of a mysterious, impenetrable fifth door near the dungeon entrances. Moonlighter is split into two distinct parts existing in something of a symbiotic relationship. 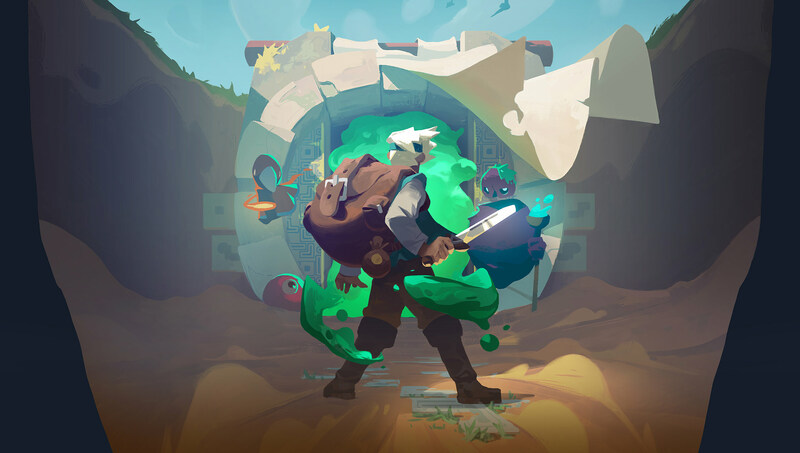 By day, your main focus will be the running of Moonlighter, a humble store passed down throughout your family which serves as the town’s hub for all sorts of loot procured from dungeon runs. Running the store is simple enough: You’ll have a few displays on which you can present items for sale, at any price you choose, and over the course of the day various townsfolk, merchants and heroes will visit, buying if they like your prices. The trick here is that the game doesn’t give any clues about the typical value of anything, so you’ll have to employ a little guesswork at first. As potential buyers examine the goods you’ve placed, they’ll react according to how you’ve priced the items — sighing and walking away if they’re too expensive, or gleaming with money in their eyes if they’ve found a massive bargain. 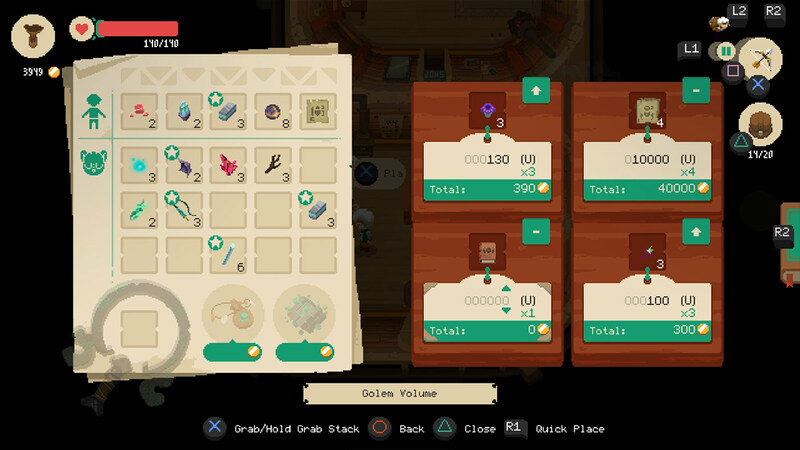 The game conveniently keeps track of the prices you put each good down as and the thresholds NPCs are reacting to, so you can see at a glance and learn very quickly whether you’re pricing a particular item too high, or selling it way under value. Once you’ve learned what things sell for, the game will prefill their price as you place them, though you’re free to adjust pricing at any time; slightly more ruthless players can up the price just enough to make customers unhappy, but still willing to pay for the items, maximising profit for a little extra work. You’ll also have the option to wander around your home town of Rynoka, talking to NPCs for flavor text and a few hints about where you could be heading next. Town exploration is very basic, serving as your way of interacting with various other merchant NPCs such as blacksmiths and potion crafters once you spend enough money to bring them to the town. You’re also able to purchase upgrades for the store, such as a larger building with more space to list items for sell at one time, or increasing the tip earned on every sale. As day turns to night, you’ll venture to the nearby dungeons to explore their depths. There are four major dungeons — golem, forest, desert, and tech — each filled with traps, secrets and fierce foes. As expected, a dungeon’s boss must be defeated in order to unlock the next dungeon, but this is no small task; early expeditions will barely scratch the first couple of floors of a dungeon before you’ll need to head back home, whether teleporting out with a backpack full of loot or by being defeated and kicked out by the ever more dangerous denizens lurking around the dungeon floors. Every visit to a dungeon feels fresh thanks to procedural generation, meaning each run you’ll have to re-explore and find your way onwards from scratch. 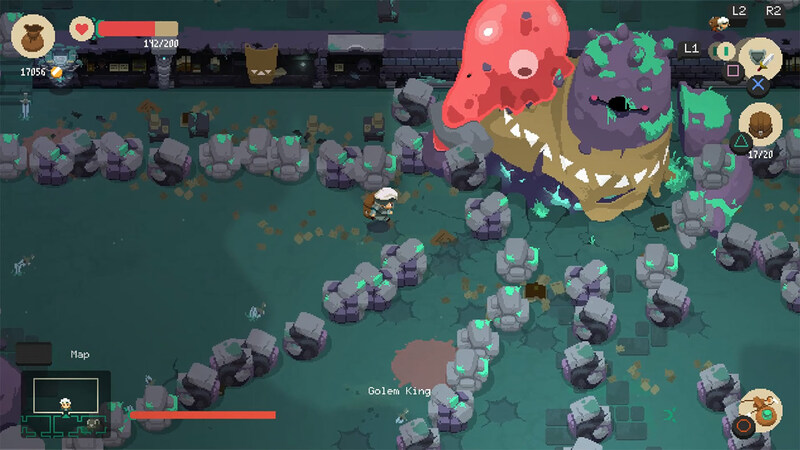 Moonlighter offers a few smart tools to avoid any potential frustration of constantly redoing a dungeon by making new tools and items accessible as you progress through the game: special potions can grant the ability to populate your minimap or summon fireflies which point towards the path onwards, and a more expensive version of your teleport home leaves a portal open, letting you return and continue from where you had reached. Dungeon runs are usually a smooth affair, with combat being easy to pick up — two weapons can be equipped at any one time, easily swapped between and each having both a standard attack and secondary action, such as raising a shield to defend or charging a high powered arrow shot. Customising how you fight is pretty easy, with six different weapon types to collect and upgrade, and each weapon category can be upgraded in one of two paths depending on whether you’re looking for raw damage increases or adding elemental damage to your attack, with all the advantages and drawbacks you’d expect. Armor is similar, with each spot having multiple options to craft and upgrade to your preference — heavy armor adding more defense at the expense of movespeed, light armor being the exact opposite, and medium armor sitting comfortably in the middle. Exploring dungeons is simple enough, and will immediately feel familiar to anyone who’s enjoyed the early Legend of Zelda games, or more recent games like Binding of Isaac. Dungeons generally consist of single-screen rooms interconnected by doors, locks and secret paths, with your goal being to find the stairs downwards in each floor to ultimately reach and take out the dungeon boss. Every visit to a dungeon brings a new experience thanks to the way they’re procedurally generated, making you have to figure your way onwards and reclear rooms each time you return; the exception to this being if you use the aforementioned portal spell to return home and keep your existing dungeon open, ideal for when you’re ready to rush through to face the boss. While dungeons may seem overly small and rather trivial to tackle at first glance — the first dungeon is just four floors — you’ll quickly find that moving beyond the first couple of floors is unjustifiable thanks to being overloaded with loot, of which there is plenty to be found. Your backpack space is very limited, and you’ll need to be farming all the drops you can, whether to use as upgrade materials or simply to sell in your shop for cash, so you’ll regularly find yourself heading back to town before even finishing a single floor. Unfortunately, exploring the dungeons starts to fall flat. The variety of enemies feels a little stagnant with slightly different variations of the same few enemies generally populating their respective dungeons, and slogging through a particular dungeon for the tenth or twentieth time just to grind the last few upgrade materials you need ready to face the boss does get old after a while. Juggling your inventory is no easy task either, with a lot of the higher value items being randomly cursed, which affects how they’ll sit in your backpack. Some items can only be placed in certain positions within the backpack, while others can alter or even destroy items in specific adjacent slots. It doesn’t have a major impact on gameplay, but you’ll regularly find yourself taking some time to rearrange your backpack after a good loot drop. All in all, Moonlighter is a rather fun title. Its spin on mixing dungeon diving and shop simulation makes for a great experience, and while the gameplay loop can grow tiresome fairly quickly, playing the game in small chunks alleviates the problem; its pick up and play nature lends well to being a great Switch title when it eventually releases on there. 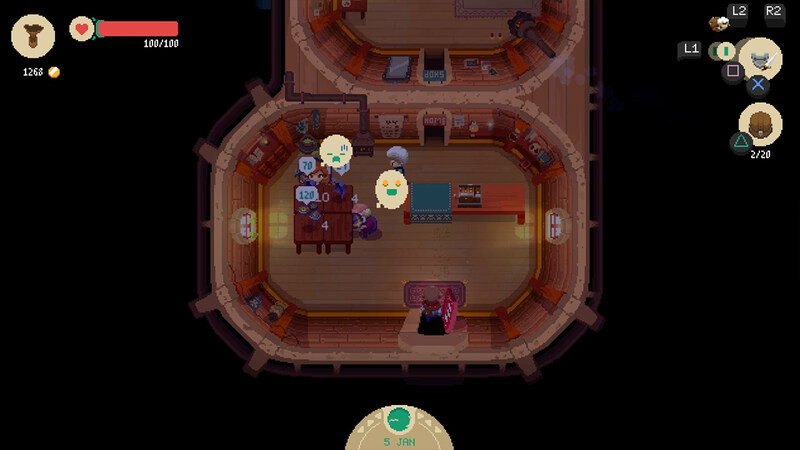 Great for bite-sized gameplay, Moonlighter is one of the most polished and well-tuned shop simulator/dungeon diving roguelites we've played in a long time. While the repetitive mechanics can become tiresome if playing for hours at a time, tackling the game in small chunks is a satisfying experience, and we'd recommend it as a casual game for most players. Avoid this game. You'll have more fun burping into a blender. Average at best. Consider if cheap or part of a bundle. Grab this if you're a fan of the genre. If not, rent or demo first. Recommended. You'll probably enjoy this game. Thank me later. Buy this immediately. Seriously. Go out and get this ASAP. GameCynic received a promotional copy of this game to review. This does not impact our review or score. We reviewed the PC version.